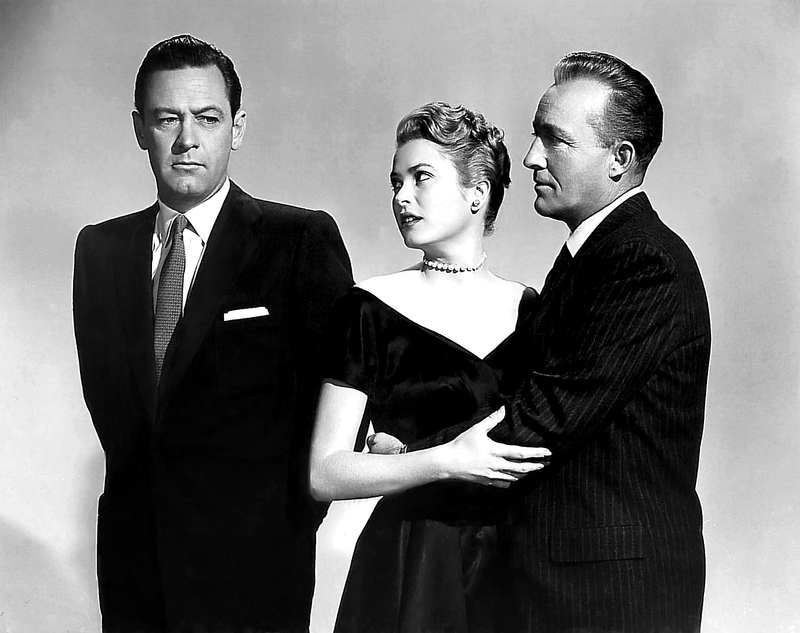 Today, I'm reviewing the drama, The Country Girl (1954), starring William Holden (left), Grace Kelly, and Bing Crosby. 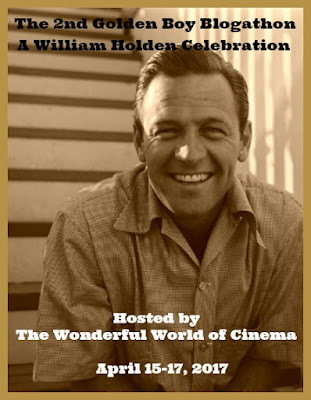 This article is part of The Second Golden Boy Blogathon: A William Holden Celebration hosted by The Wonderful World of Cinema. 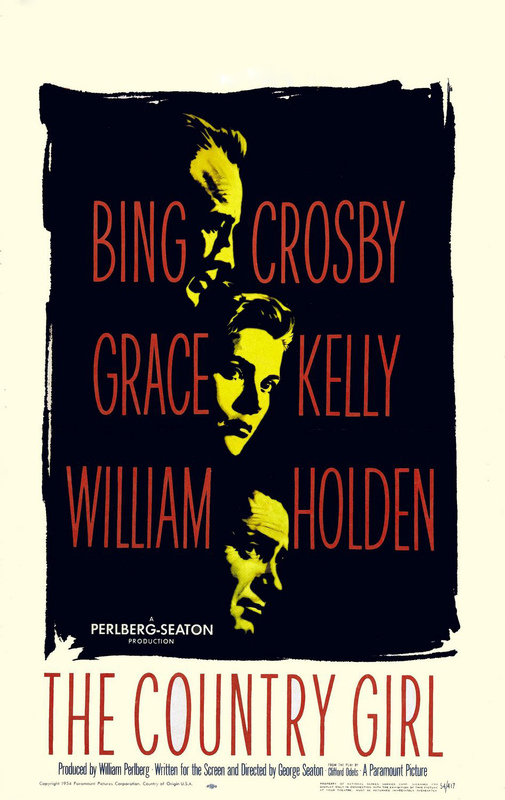 The Academy Award-winning drama, The Country Girl (1954), allowed William Holden to show-off his serious acting chops by playing a frustrated theatrical director who must battle an alcoholic actor (Bing Crosby) and his controlling wife (Grace Kelly). The Country Girl begins when theatrical director Bernie Dodd (Holden) hires a washed-up singing star star, Frank Elgin (Crosby,) to play the lead in an Oklahoma-esque musical called, This Land Is for Us. Frank has been on a career decline since his young son (Jon Provost) was killed in a car accident several years ago, and he has trouble with everything from showing up on time to remembering his lines. At first, Bernie blames Frank's unprofessionalism on the controlling behavior of his tightly wound wife, Georgie (Kelly). However, once Bernie gets to know the couple better, he finds out that all of Frank's tales of woe are not necessarily true. The Country Girl is based on a 1950 Tony Award-winning play by Clifford Odets that was adapted for the screen by director George Seaton (Ironically, Holden's breakthrough role was in the 1939 adaptation of Odets' play, Golden Boy). Seaton cast Holden and Crosby, who were two of Paramount Pictures' biggest stars for the male leads, but Kelly, who was under contract to MGM, had to fight to get the role after Jennifer Jones dropped out because of pregnancy. The result was a box-office hit that earned piles of critical plaudits. The usually hard-to-please critic Bosley Crowther of The New York Times penned a rare rave review that singled out Crosby's emotionally honest performance for special praise. The Country Girl was nominated for seven Oscars and took home two awards. Seaton won for best adapted screenplay and Kelly, in a surprise win, took home the best actress trophy, which was presented to her by a delighted Holden. 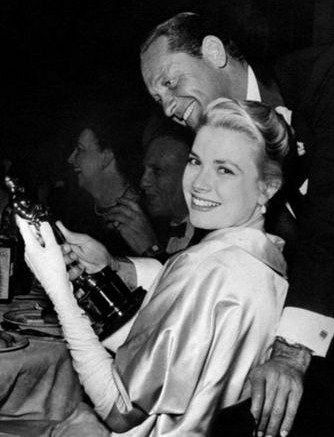 William Holden congratulates Grace Kelly on her Academy Award for The Country Girl (1954). Today, The Country Girl is remembered by classic movie fans for two reasons. First is Kelly's upset win as best actress. Judy Garland, who made her big-screen comeback in A Star Is Born (1954), was widely expected to take home the trophy. Kelly's victory caused a minor scandal -- Groucho Marx privately told Garland her loss "was the greatest robbery since Brinks" -- and whether or not Kelly deserved the Oscar is still a hotly debated subject among classic movie fans in 2017. For the record, I think Kelly deserved the Oscar, although it is disappointing that Garland wasn't honored for the best performance of his career. Second, Holden appeared on the "Hollywood at Last!" episode of I Love Lucy to promote The Country Girl. He mentions the film in the famous scene where Lucy disguises her appearance after an embarrassing run-in with Holden at the Brown Derby restaurant (click here to watch). However, all of these issues have somewhat obscured the considerable artistic merits of The Country Girl. Both Crosby and Kelly give sensational performances. The beautiful actress sheds her glamorous image to play a bitter and defeated middle-aged housewife, while Crosby leaves behind his genial crooner persona to play a cowardly drunk who uses both his son's tragic death and his wife's difficult nature to absolve himself of any responsibility at all. In fact, both actors' searing performances make the film's production code-approved happy ending seem very unrealistic. 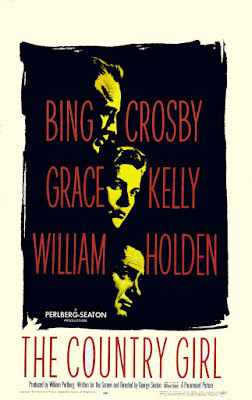 While most of the critics gave their acting plaudits to Crosby and Kelly, Holden is also quite good in a performance that required him to put a new twist on the time-honored Hollywood role of the obsessively demanding theatrical director. The chain-smoking Bernie, who barks orders like Warner Baxter in 42nd Street (1933) and plays mind games worthy of Anton Walbrook in The Red Shoes (1948), becomes almost an amateur psychiatrist to Frank and Georgie. He conjoles, argues, counsels, and threatens until, in the end, he finally gets what he wants: The chance to put on a hit Broadway show. In between all of the dramatics, Crosby is actually in fine voice throughout The Country Girl (1954). I'll leave you with Bing crooning "The Search Is Through" in a flashback scene. You can check out my review from last year's Golden Boy blogathon here. It's about Holden's other film with Kelly, The Bridges at Toko-Ri (1954). The Country Girl is available on DVD and video on demand. Hey I'm glad that you also agree that Grace Kelly deserved her Oscar! Anyway, that was a great and informative review! As always I really enjoyed reading it :) I loved your comparison with Warner Baxter in 42nd Street! The more I see The Country Girl, the more I love it. And the performer are just wonderful! Funny enough, today is also George Seaton's birthday! Happy belated birthday to George Seaton. Love Miracle on 34th Street. The Country Girl is a powerfully emotional story of three intriguing characters, and the actors bring a lot of talent to the script. I hope those who haven't seen it will be encouraged by your article. Truly, the film has much to offer beyond never-ending Oscar debates. Yes, if you've only seen Crosby in the road movies, he is a revelation here. The first time I saw this, I was very annoyed with it because I was expecting it to be kind of fun, just from the presence of Bing Crosby. When I watched it a second time, I knew more what to expect and liked it very much indeed. "Searing" was the perfect word to use to describe the performances in this -- nicely done. The film is kind of disorienting for classic movie fans. I spent the first 20 minutes wondering what happened to Grace Kelly's face before I could really get into it.